Recent advancements in dental technology have allowed dental implants to become the preferred option for restoring missing teeth. Through scientific research and discovery, implant dentistry has been changing the art of restorative procedures one smile at a time for the last 25 years. As a permanent replacement for tooth loss, you’ll not only gain a stunning new smile, but preserve your oral health and gain an improved quality of life as well. Dr. McKnight is the implant surgeon in Mesquite, TX you need to create a customized new smile with long-lasting tooth replacement. Implants offer a comfortable, stable, and attractive option for teeth replacement because they closely mimic your own natural teeth in terms of both function and appearance. Titanium posts are surgically inserted into the jaw bone to act as a new tooth root. Then, porcelain prosthetic crowns are placed onto the posts to serve as the tooth above the gum line. With a nearly 100% satisfaction and success rate, implants are a long-term investment in your quality of life and oral health. Having missing teeth is more than just a cosmetic issue that impacts your confidence. Missing teeth cause your oral health and quality of life to decrease if they are not replaced. Once a tooth is lost, the structures that supported the teeth are no longer stimulated, causing these structures and bone to quickly deteriorate. In fact, as much as 25% of bone can be lost within the first year from just one missing tooth, causing the surrounding teeth to eventually shift, become loose, and even fall out. This destabilization causes an increased risk for gum disease and tooth decay as well. Over time, the loss of structure and bone causes the appearance of your face to change, causing a sunken appearance. Your quality of life decreases as you lose your ability to chew and speak correctly. But, with an implant, you’ll have an increased biting force much stronger than traditional dentures. 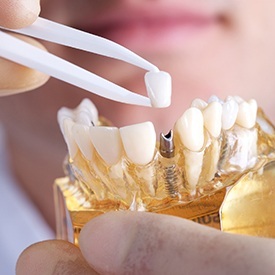 Plus, as the teeth are surgically inserted, they will never need to be removed, so there’s no messy cleaning, no need for adhesives, and no slipping when eating or speaking. You simply care for your implant as you care for your own natural teeth with regular brushing, flossing, and cleanings from your dentist. Dental implant surgery is a fairly invasive procedure that requires an implant surgeon like Dr. McKnight. Dr. McKnight will use the latest advancements and technology to map out your mouth to create a plan of treatment. He will determine all aspects of your treatment, including if bone grafting is needed and which type of implant will be best for you. Then, he will insert the titanium posts into the jaw bone to act as a tooth root, giving the implanted tooth a sturdy and stable foundation. Once the bone has healed around the implant, the custom-made prosthetic tooth will be attached to the post, giving you a new smile and restored function. 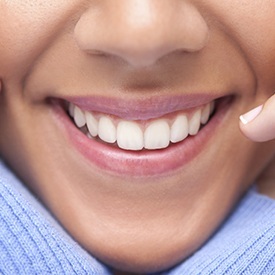 If you’re ready to restore your smile, Dr. McKnight is ready to help you with dental implants. Contact him today to schedule a consultation.